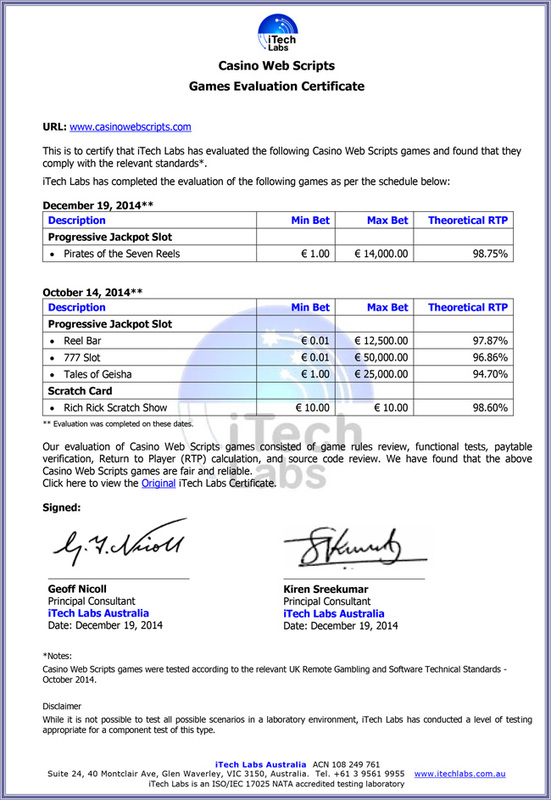 As of 24 March 2014, CasinoWebScripts RNG has been officially certified by iTech Labs. iTechLabs is one of the top casino game testing companies in the world. Their job is to test and certify the quality of casino related products and confirm if those products can be used for a real casino. Our products passed this test. The logic of our games, the calculation of odds and payouts have been developed to ensure a fair environment for every player that enjoys spending time with our games. It is important for each user to feel safe and to know that he has the same chances as any other player to win, when wagering at any casino that uses our games. To prove that we are serious about this, we have taken action and managed to get our Random Number Generator (RNG) tested and certified. 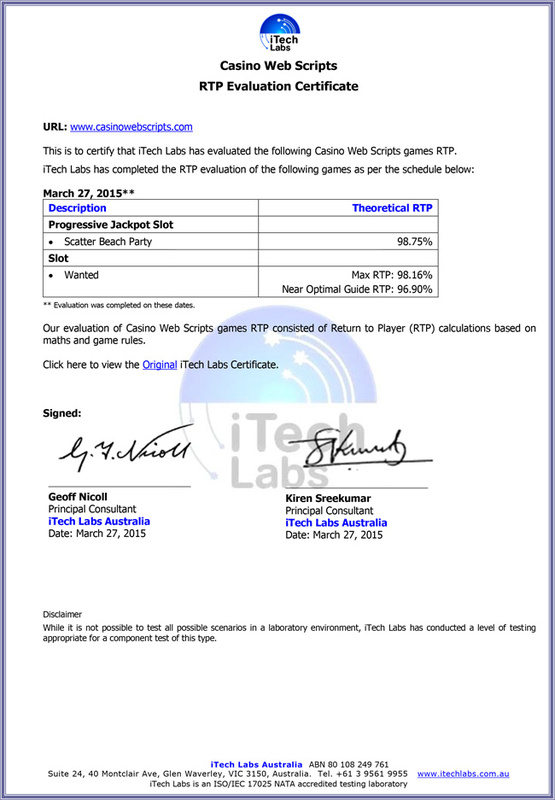 The tests have been made by iTech Labs, an Australian testing laboratory for online gaming systems. Randomness tests using Marsaglia's "diehard" have been successfully applied to ensure the numbers generated by the RNG algorithm are unpredictable and statistically acceptable. Billions of seedings, re-seedings, background cyclings and number generating sequences were executed. The source codes of our games have been sent to iTech Labs and tests have been performed for evaluating the implementation of the RNG for each game and the scaling for slots, roulette, keno, hilo and scratch cards. iTech Labs has also evaluated card shuffling for single deck, 2 decks, 4 decks and 8 decks card games and for dice games. Our lottery games have also been certified to ensure fairness and unpredictability. The scaling/shuffling tests were conducted on large enough samples to give the calculations sufficient statistical power. iTech Labs has found that the number and card sequences are unpredictable, non-repeatable and uniformly distributed. We consider this certification to be a critical step into offering a safe and secure solution, using the latest standards, for everybody that interacts with our products. Now that our RNG has been certified and is considered a safe and reliable core solution for the games, our clients can use our products for applying for a gambling license in any jurisdiction. 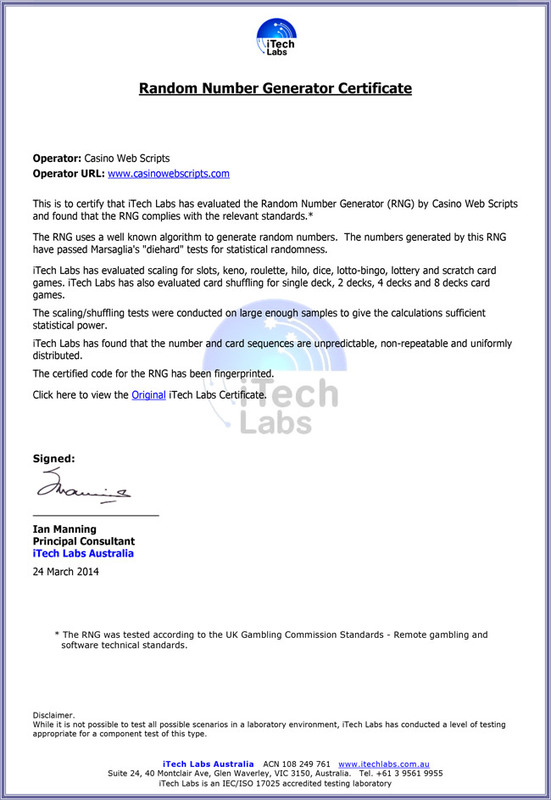 Click here to view the Original iTech Labs RNG Certificate, hosted at iTech Labs website. Click here to view the Original iTech Labs Certificate, hosted at iTech Labs website.